Dan Biggar has the ball out against South Africa. South Africa stayed in the game on the mostly reliable foot of Handre Pollard but had to find the try line with only six minutes left in the game to secure a 23-19 quarter-final win over Wales in the Rugby World Cup. Wales led at halftime by one point, 13-12, and kept a slim lead on the kicking by Dan Biggar. His penalty kicks gave them a 16-12 lead before Pollard hit a drop goal to make it 16-15. Another Pollard penalty kick at 60 minutes gave South Africa the lead at 18-16. Biggar got Wales back into the lead, 19-18, with another penalty three minutes later. Then at 74 minutes into the match, the Springboks had a set scrum on the Wales 25 yard line. Bryan Habana, who has tied the record for World Cup tries, set up behind the scrum, and the Wales defense moved left away from the sideline to cover him. But the Springbok No. 8 took the ball toward the sideline, left open by the Wales shift. A pass to Fourie du Preez, the scrum half, put him away for the winning try. South Africa will play in the semi-finals next weekend against New Zealand. The winner of Sunday’s Australia-Scotland game will play Argentina, the surprise winners Sunday against Ireland, 43-20. 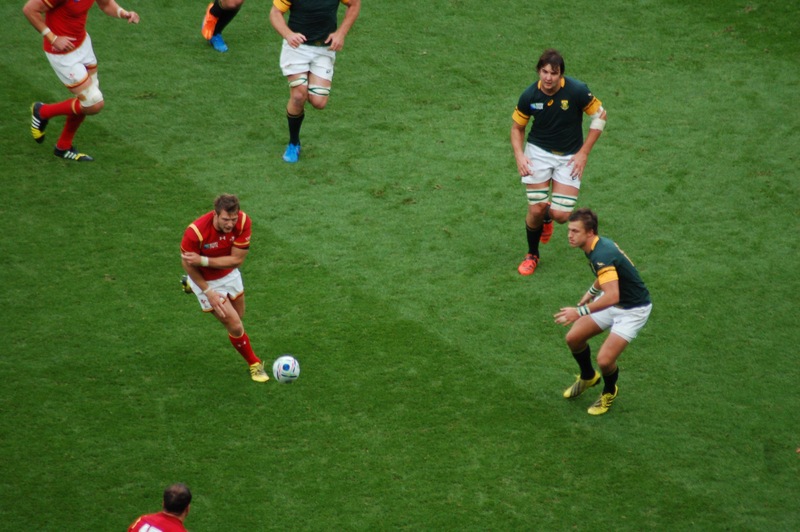 Wales’ last minute heroics took the game past 80 minutes until South Africa was able to wrestle away possession and kick into touch to end the game. 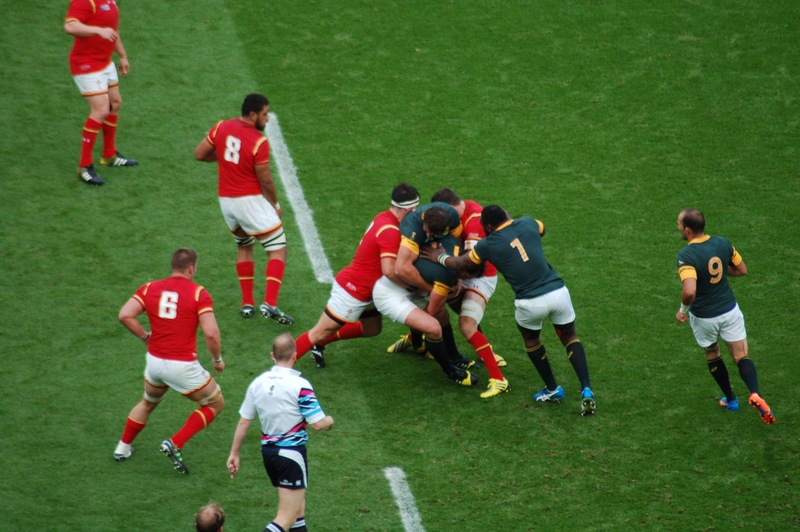 South Africa forwards secure the ball against Wales.